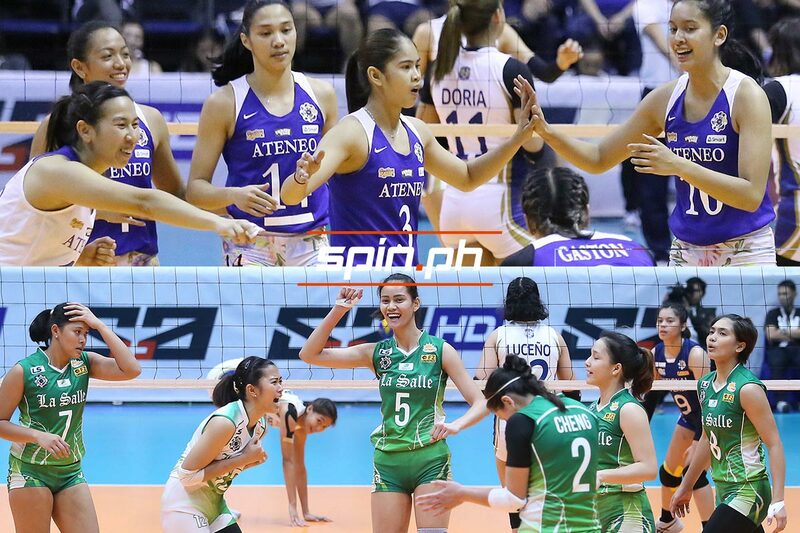 ATENEO and De La Salle clash for the final time in the elimination round of the UAAP Season 81 women’s volleyball tournament on Saturday with important implications to both team's playoff hopes. The 4 p.m. grudge match at the Smart Araneta Coliseum will have league-leading Ateneo (10-1) trying to lock up the top seed and twice-to-beat advantage and La Salle (8-3) looking to seal its place in the Final Four. La Salle took down Ateneo in the two rivals' season debut, 25-14, 25-17, 16-25, 25-19, last February 17 at the Mall of Asia Arena, but the Lady Eagles have won 10 straight games since to assure themselves of a Final Four spot. Lady Spikers head coach Ramil De Jesus acknowledged that they are facing a different Lady Eagles side that's brimming with confidence. “Alam naman namin since offseason pa makikita mong bawat rotation [ng Ateneo] matatangkad. Medyo malalim din yung bench, maraming napapaikot (na tao),” De Jesus said. “Nakatapat na namin sila nung first round, nagulat sa amin. Sana magulat ulit." Ateneo coach Oliver Almadro said he and his side are ready for the pressure. “Well darating talaga ‘yung game na kakalabanin namin sila. But what I’m telling my players is just that be better than your best,” Almadro said. Kat Tolentino, co-captains Maddie Madayag and Bea De Leon and setter Deanna Wong are all raring for payback against their first-round tormentors. “I think we’ve learned a lot in the first round, we learned how to play better as a team and we’ve got rid of those first-game jitters,” Tolentino said. La Salle will be banking on skipper Desiree Cheng and rookie Jolina Dela Cruz as well as Tin Tiamzon and Aduke Ogunsanya with Michelle Cobb running the offense for the four-peat-seeking Lady Spikers. “They’re the most hungry to get the championship. Siyempre kami ‘yung unang loss nila this season so I guess they’re gonna come into Saturday’s game very ready and siyempre kami rin,” Cobb said. Cellar-dwellers Adamson (1-10) and University of the East (2-9) clash in the day's other game at 2 p.m.